Manchester United manager was asked about Fred during Friday’s press conference after the Brazilian spent 15 days away with his national side during the international break. That sounds significantly longer than the rest of his United teammates (except Andreas Pereira), which probably concerns Mourinho a little bit. And that’s how the manager came across in the press conference. Fred didn’t start in the 2-0 win over Burnley, with Marouane Fellaini coming back into the line-up and performing exceptionally. However, the Belgian has been ruled out of this clash so there’s a chance Fred will feature at Vicarage Road. Fans are still excited about the prospect of Fred being a relatively new signing and competition for places is always a good thing. 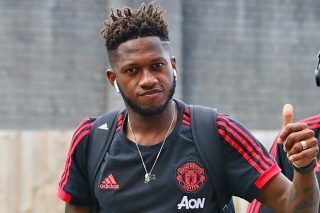 While he will provide that over the course of his debut season, Fred should kick on and become a big player for United. He’s quicker than our other midfielders when it comes to getting the ball forward and his reading of the English game will get better with time. The former Shakhtar Donetsk midfielder likes to get involved and is constantly busy. These are really promising signs.